The company expects the latest round to take it to profitability. 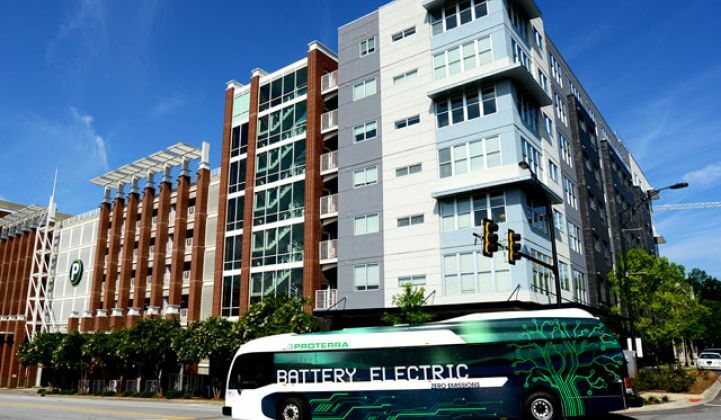 Proterra closed a $55 million strategic financing round to fund its growing all-electric bus business. The $30 million Series D equity round was led by several new strategic investors including a sovereign fund from the Middle East, Mike Dorsey and Miriam Rivera, as well as individual investors and an unnamed family office. There was also a $25 million debt financing round with new investor Hercules Technology Growth Capital. The firm has raised a total of more than $150 million* in equity funding from investors including KPCB, GM Ventures, Hennessey Capital, NMT Capital, Mitsui & Co. Global Investment, 88 Green Ventures and Vision Ridge Partners. The combination of funding is expected to carry Proterra to profitability. “While the company has made great strides within the last year, we’re really looking forward to supporting Proterra through this next stage of expansion,” Michael Linse, a partner at KPCB and Proterra board member, said in a statement. The injection of debt capital will help fund Proterra’s new manufacturing facility in California. The company’s CEO, Ryan Popple, recently told Greentech Media’s Eric Wesoff that it has 100 electric buses shipped or under order, as well as a number of clients that are placing additional orders. Proterra designs and builds all of the parts of its buses in the U.S.. The products include full-size transit buses and shuttle buses. Many of the company’s clients are municipalities interested in lower-emissions options, often to meet mandates. Proterra uses battery packs from Toshiba and LG Chem. It uses automotive-grade, industry-standard batteries and is prepared to ride the commodity cost curve. In recent years, Proterra has been able to reduce the cost of its buses to less than $800,000, largely due to battery cost reductions, although that’s still a significant premium compared to conventional buses that cost about $500,000. By 2016, Popple expects the payback compared to a diesel bus to be two years. Proterra's not just competing against conventional technology, however. BYD Motors, based in China, is the world’s largest all-electric bus maker and has sold more than 5,000 units. Another U.S.-based all-electric chassis maker, Motiv, has so far developed shuttle buses and school buses, but not full-size transit buses. *This story has been updated with a more accurate tally of Proterra's VC funding.